Runners stretches performed regularly will keep you on the road and help prevent some injuries. 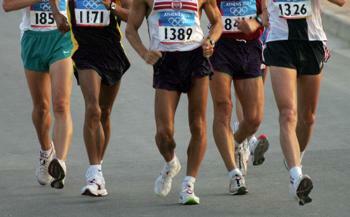 Running is probably the most popular sport of all. Almost anyone can do it. The popularity of running is evident as marathons and charity runs spring up in almost every city. Even in a sport as universal as running, the athlete has to maintain an understanding of proper training and the ability to detect injuries. What does the literature say about the effects of stretches for runners? How does stretching prior to running improve running economy? How can runners stretching improve performance? What does the literature say about the effects of runners stretches? When determining if stretches for runners will improve running performance, it is necessary to define the parameters that are necessary for good performance. Most studies look at running economy, and running speed. While it is well determined that pre exercise stretching reduces force and velocity of a muscle contraction, it appears that running economy is improved. It's effect on running speed seems to be controversial. Looking at three different studies (1-3)examining running efficiency, and speed, it was found that running economy improved in a group of individuals that were determined to have tight hip musculature. Examining the effects of stretching on running speed in athletes, one study showed a detrimental effect with two sets of 30 second static stretches, and another study showed a beneficial effect of one set of 30 second static stretches. In the study that showed beneficial effects, dynamic stretching was more effective than runners stretches done statically. Stretching prior to running reduces viscoelasticity of the muscles and tendons. (4) Because of this reduction in stiffness it requires less energy to move the muscles. How can runners stretches improve performance? Stretching reduces the viscoelastic behaviour of the muscle immediately after stretching therefore requiring less force to contract. regular stretching improves stretch tolerance. There is hypertrophy of the muscle that occurs with daily stretching theoretically resulting in increased force with contraction. A runner's stretch can produce an acute analgesic effect which may reduce pain mediated muscular inhibition in someone with an injury. Stretching can be a mode of mental relaxation that can improve performance. This muscle group is easily stretched with the lunge. Put one knee on the ground and the foot of the other extremity on the floor in front of you. Put your hand on the hip you are stretching and push your pelvis forward. From the above hip flexor stretch position, grab your foot behind you and bring your heel toward your buttocks. You should feel a stretch on the front of your thigh as you stretch this part of your quadricep that crosses your knee and your hip joint. 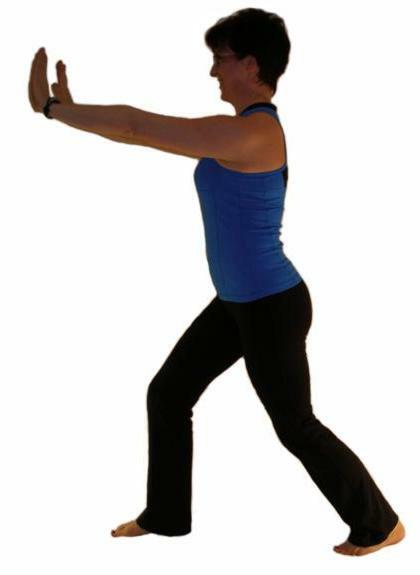 To stretch the other parts of the quadricep group, stand and grab hold of your ankle behind you with the opposite hand. Pull you heel up toward your buttocks and hold. Hamstrings can be stretched in a number of different ways. Here I show you the standing hamstring stretch. As you lean forward into this stretch be sure to keep your chest up and your back straight so as to avoid over stretching or injuring your back. Cross one leg over the other in a sitting position. Keep your chest up, back straight, and lean forward at the hips as you apply a gentle downward pressure to your knee. Now grab that same knee and pull it up toward the opposite shoulder. This runner stretch is very important and often overlooked. The iliotibial band is a long thick band of fascia that stretches from the outside of the hip down to the tibia. It is frequently problematic amongst runners when it is tight. To stretch the right side, stand with your right side facing the wall, right foot behind the left, toes out at about 45 degrees. Put your right hand on the wall and your left hand on your left hip. Keep your chest up and push your hip toward the wall. Other ITB stretches can be found here. The easiest calf stretches are those done in standing. To stretch the right side, stand facing a wall, put your right foot behind your left, toes facing forward, heel on the ground. Lean forward at the ankle while keeping your knee straight. Hold this for 20 to 60 seconds (see article for more information on how long to hold a stretch). Then bend your right knee, keeping your heel on the ground. Hold this again to stretch all parts of the calf. Gradual onset of pain, usually during or shortly after running. Although it is initially possible to run through the pain, as the condition progresses the pain can become severe enough to limit running. The tear usually involves the calf, hamstrings, groin, of glutes. The pain during running can be severe, but always improves with rest. Contraction of the involved muscle becomes very painful. The runner can rest for months, but the pain will recur if running is resumed without physical therapy. Upon palpation there is often a very tender "knot" in the involved muscle. Chronic muscle tears are likely due to forcefull eccentric contractions and are usually noticed when there is a change in training either more speed or more distance. The connective tissues within the muscle lack the eccentric strength to withstand the forces in running. Once an initial small tear begins to develop it heals with scar tissue. This scar tissue is weak initially so quickly retears when running again. The knot that develops is likely muscle fibres surrounded by scar tissue. Treatment involves manual cross frictions, ultrasound, and the appropriate runners stretches and strengthening by your physical therapist and can last several weeks. Usually the more chronic the injury, the longer the period of treatment required. These injuries tend to recur so it is important for the runner to stretch adequately prior to running and especially the morning runs and the faster runs. It is also essential that at the first sign of reinjury that the runner seeks physical therapy immediately so as to speed recovery. To prevent chronic muscle tears a good eccentric strengthening program is important. For example running backward down a hill will work the calves eccentrically. The best method of preventing these chronic recurring tears is through a program of appropriate eccentric training as well as runners stretches. A stress fracture is a small fracture that develops in the bone as a result of repetitive minor injuries that can occur over weeks or months. Stress fractures will occur in the bones that may be too weak to sustain the forces imposed on them during running. Pain associated with a stress fracture is usually tolerable at rest or with light exercises but quickly becomes intolerable with the impact forces involved with running. It will often even prevent running. Pain usually starts without any apparent reason. If the fracture is in the pubic bone the runner may find just standing on one leg to be painful. Fractures in the other bones become painful with hopping on one foot. Tenderness is felt at the site of the fracture. Stress fractures can take six weeks of rest to heal, sometimes those of the pelvis can take longer. Who is prone to stress fractures? Women are 12 times more likely to experience stress fractures than men and women with hormonal irregularities are particularly vulnerable if they have low estrogen levels. Stress fractures are more likely to occur in novice runners 8 to 12 weeks after training has begun. Runners who suddenly increase their distances, run very long races, or train too heavily are more at risk of developing a stress fracture. Runners who run in very hard running shoes or training spikes may also increase their risk of stress fractures. Runners with a high arch seem more susceptible to stress fractures of the femur and metatarsals. Runners with a low arch or a pronating foot are more susceptible to stress fractures of the tibia and fibula due to faulty biomechanics. Treatment of a stress fracture is 6 to 12 weeks of relative rest to allow the bone to heal. Immobilization is usually not required unless the neck of the femur is involved, but this needs to be determined by and orthopaedic surgeon. Exertional cramps should not be confused with cramps that can accompany more serious disorders. For that diagnosis you must see a physician. Exertional cramps among runners usually occur in runners that increase their speed or distance more than what they are used to. To prevent cramps be sure to stretch adequately before hand, remain well hydrated, and don't run too face early in a race. Stretching to prevent cramping should include a static stretching program 10 minutes per day involving the affected muscles. Vague leg pain only after exercises. Pain during exercise as well. Pain limits anything more than walking. This injury will progress through to grade 4 if training continues without treatment. To make a correct diagnosis your physical therapist must rule out chronic tears of the tibialis anterior and tibialis posterior muscles. Localized tenderness is always felt at the area of injury where the bone is affected. Causes of this bone strain are overpronation or poor adaptation to the excessive shock of running. Anteriorly, overstriding causes the muscles on the front of your leg to work harder eccentrically. 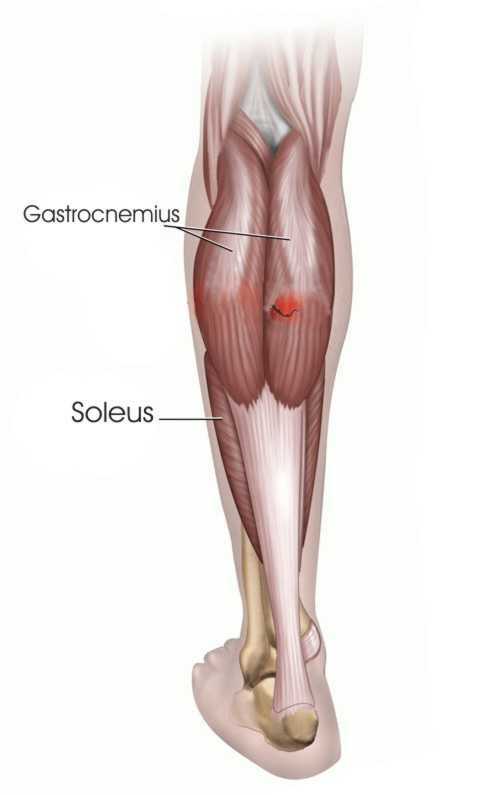 This overworking of the muscle creates pain and injury to where these muscles attach to the tibia. 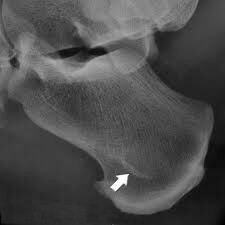 Posteriorly, this pain is thought to develop due to twisting of the tibia and fibula due to excessive pronation leading to minute bone cracks that are painful. Poor bone density or bone strength. Treatment of this injury will depend on identifying causal factors. If you suffer from this type of pain be sure to consult your family doctor or physical therapist. Achilles tendonitis is an acute inflammatory condition affecting the achilles tendon. There is degeneration of the tendon, microtearing with an inflammatory response. Paratenonitis is inflammation of the paratenon and may or may not me accompanied by tendon degenerative changes. Achilles tendinosis is not accompanied by an inflammatory response and doesn't respond to antiinflammatories. This is one of the most debilitating injuries a runner can sustain and becomes more commonly found amongst older runners. Pain only upon rising in the morning that doesn't last. Pain is also experienced after exercise. Pain during exercise that hinders performance. 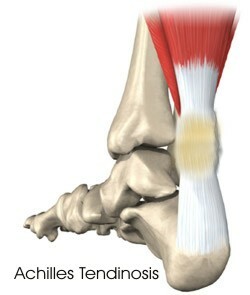 Achilles tendinosis can be caused by excessive pronation. This abnormal foot motion essentially wrings the tendon creating excess strain to the tendon, and its matrix where it has a poor blood supply. Also, age and minor degenerative changes reduce the tendons ability to absorb shock, causing further degeneration of the tendon. Sudden increase in training distances. Sudden return to training after a break. Stiffness of the calf due to inadequate stretching. Shoes that old or worn. Shoes that are too hard. Shoes with a heel less than 12-15 mm. Treatment of achilles tendinosis requires addressing the causal factors above. See your physical therapist for the appropriate exercises, modalities, and manual therapy. Tears of the achilles tendon occur usually after a history of chronic achilles tendinosis. There may or may not be a history of pain prior to the rupture. The treatment for this is immediate surgery. The torn tendon begins to degenerate soon after the injury, making any surgery difficult if there is a delay. Delayed onset muscle soreness is a feeling of muscle discomfort that peaks at 24 to 48 hours after a a new or unaccustomed exercises, or training intensity. The cause is hypothesized to be damage to the supporting connective tissues in the muscle. There has been research done lately that have found there is death of muscle cells in marathon runners that complain of bad delayed onset muscle soreness. Repetitive powerful eccentric muscle contractions cause cell damage and the accumulation of calcium inside the cells. Cell death peaks about 48 hours after the exercises. It is the inflammatory response that accompanies this that stimulates pain receptors in the damaged muscle. Continuing to train with sore muscles can delay recovery. 1. JJ Godges, H MacRae, C Longdon, et al. Effects of two stretching procedures on hip range of motion and gait economy. J Orthop Sports Phys Ther. 1989;March:350–357. 2. AG Nelson, NM Driscoll, DK Landin, et al. Acute effects of passive muscle stretching runners stretches on sprint performance. J Sports Sci. 2004. 3. T Little, AJ Williams. Effects of differential stretching protocols during warm-ups on high speed motor capacities in professional footballers. J Strength Cond Res. 2006 Feb;20(1):203-7.